The election is taking place amid the worse economic crisis the capitalist system has seen since the Wall Street collapse in the US in 1929. Elections will also be held across Europe and pundits are speculating that the results of the elections will determine the future fortunes of many politicians and parties on this island and neighbouring Britain. In the six counties the contest will determine the extent to which Sinn Féin continues to lead the nationalist electorate through the vote for EU candidate Bairbre de Brun. On the unionist side the big question is the level of support that former DUP MEP Jim Allister can muster. Allister’s popularity will determine whether he can build a political party capable of attracting those inside the DUP to his standard or will he go the way of Bob McCartney who vanished from the political scene, a casualty of the DUP’s formidable election machine. Allister is an unknown quantity beyond a by-election result in Dromore, County Down, when he secured 20 per cent of the first preference vote and deprived the DUP of a council seat. Some commentators are using this result as a yardstick for his likely performance next week. However, he refused to stand a candidate in Fermanagh against Arlene Foster - who picked up a council seat - which would suggest that he is not entirely sure of his political ground. However, he is sure of the message he wants the unionist electorate to hear in this election - his opposition to the peace process and the all-Ireland power sharing institutions that have Sinn Féin and the DUP leading the executive. His vitriolic and intemperate language not only jars on the ear but is a disturbing reminder of an earlier DUP era - an era Allister is seeking to recreate. Sinn Féin’s campaign is centred on defending the peace process and the political gains made over the last decade. Political progress and nationalist gains are under attack not only from Allister but like-minded DUP dissidents and republican dissidents wedded to armed actions. Under its campaign slogan ‘Putting Ireland First’ Sinn Féin is looking to the electorate in the north not only to endorse its strategy but to do so in even greater numbers than voters did before, thereby reelecting the sitting MEP Bairbre de Brun. This appeal is designed to maximise the nationalist vote for Sinn Féin at a time of uncertainty inside unionism and has worked on previous occasions when nationalists tactically voted for either Sinn Féin or the SDLP. It happened in Newry/Armagh when Seamus Mallon of the SDLP was elected by Sinn Féin voters. It happened in Mid-Ulster and West Tyrone when SDLP voters backed Martin McGuinness and Pat Doherty of Sinn Féin. It is at times like this that the electorate assess the value of their vote and what impact it will have not just for the candidate they are usually loyal to but to the wider political situation. Nationalists know that the SDLP candidate is too far behind Sinn Féin to take the seat from the party. They also know that staying at home is not an option. an unequivocal message to the wreckers by backing Bairbre de Brun. 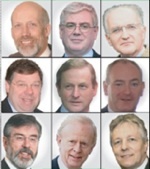 The handling of the economic crisis by Taoiseach Brian Cowen is the main issue in the election in the 26 counties. While the outcome of EU elections are not usually treated as a barometer of future intentions, local elections and by-elections are also being held and all take place at a time when several opinion polls show Cowen’s government losing significant support. Sinn Féin is the only party contesting the EU election across the island and standing candidates in the local elections. They are hoping to add support to the already 323,983 people who vote Sinn Féin and their 275 elected representatives - 27 MLAs, four TDs, five MPs, two MEPs, one senator and 236 councillors. An impressive line up in anyone’s book.